With every new Microsoft operating system, regardless of it being a client or server OS, come new and modified services. System administrators as well as end users who are interested in optimizing their PC and knowing what's running in the background need to spend time to analyze the changes. One of the best Windows Service related Internet sites is Black Viper's website. The site offers service listing for all recent Windows operating system. 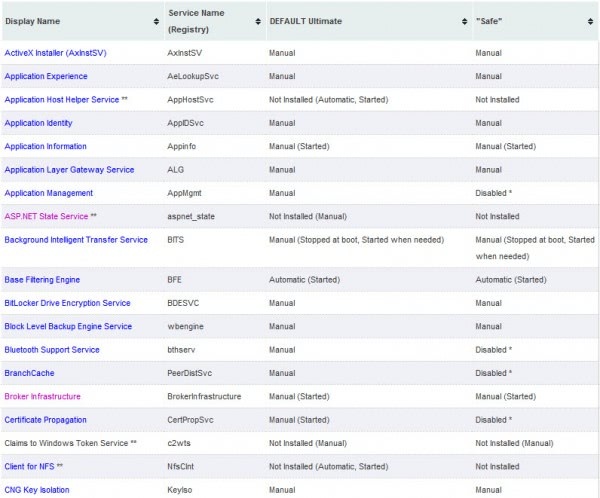 Charles M. Sparks, the guy behind the Black Viper site, has recently posted an update listing all preliminary Windows 8 services. You find all current Windows 8 services in the list, their service name, the default Windows 8 Ultimate configuration setting and the recommended "safe" setting. Why only Ultimate? Because Microsoft so far has only released that version in form of the Windows 8 Developer Preview. Users may be able to test other Windows 8 editions when the beta or release candidates come out. Each service is linked to a Wiki entry on Black Viper's website where additional information are provided. Here you find a service description, default path and command line options, account it is executed on and additional information. All Windows 8 service information are preliminary in nature. Still, users who are currently running the Windows 8 Developer Preview release can use the information presented on the site to tweak their Windows 8 operating system. If you have been using Black Viper's site previously you may remember that the services listing included not only a Safe listing but also a Tweak and Barebones listing. Safe settings are not aggressive and should not cause troubles for the majority of users. It is the best setting to start with and it is likely that Charles will add tweak and barebones listings at a later time. For now, Safe and Default is all you can get. I hope you plan to repost all the Windows 8 tips and tricks once it becomes a Final release! I’m not playing around with the Developers version for obvious reasons! I will do some overview posts.